Yes, it's possible to drive a stunning compact sport-ute that won't cost you a fortune on fuel when it's the all- Toyota RAV4 Hybrid. These lean green machines are available now at Lakeland Toyota in Lakeland, FL, serving the communities of Plant City and Brandon. A RAV4 Hybrid is a fantastic way to reduce your carbon footprint and have a blast doing so. Let's grab the keys, seat you in the cockpit and start the hybrid engine of this beauty so you can turn heads all over Central Florida in your 2016 RAV4 Hybrid today! With the popularity of the sporty and bold RAV4, it was only a matter of time before Toyota, one of the leaders in hybrid technology, came out with a hybrid version. The 2016 RAV4 includes the same powertrain featured in the Lexus NX 300h, with Lexus being the luxury arm of Toyota. Pop the hood and you'll find a 2.5L four-cylinder Atkinson-cycle engine with 154-horsepower, which is married to Toyota's Hybrid Synergy Drive system, an AC synchronous motor, and eCVT transmission. Together, this combines for net power of a massive 194 horses -- which is even mightier than the gas-powered RAV4. And unlike many hybrid crossovers, the 2016 RAV4 Hybrid features standard AWD, which uses an electric motor , instead of a mechanical system, to provide torque to the rear wheels. 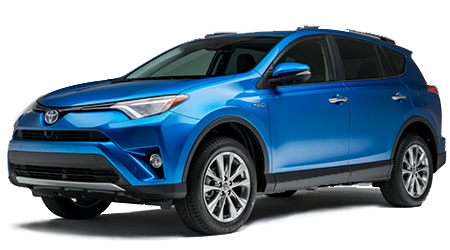 Because the 2016 RAV4 Hybrid is a brand-new model, fuel economy numbers have yet to be released. The 2016 Toyota RAV4 Hybrid is available in two loaded trims, the Hybrid XLE, and Limited and mirrors many of the same features on its gas-powered RAV4 brethren. New exterior features on both models include a shark fin antenna, three new colors, and more fluid visual cues. More interior refinements have been added to spruce up the cabin, including premium materials, a revised TFT gauge cluster, leather-wrapped steering wheel, better cupholders that can handle tall mugs with handles, a sunglass holder, additional USB and 12 volt ports, and soft touch material on door panels and dashboard. You'll love saving the planet and saving tons of money in a 2016 RAV4 Hybrid when you buy or lease it for Lakeland Toyota in Lakeland, FL. Come see what all the fuss is about right away so you can wave goodbye to your gas station attendant as you drive back to Brandon and Plant City in your emissions-friendly 2016 Toyota RAV4 this evening!